Mark your calendars!! Treat yourself to an evening of fine food, live entertainment and lots of fun at Taste of Tyler! April 3 is A Time to Dine. 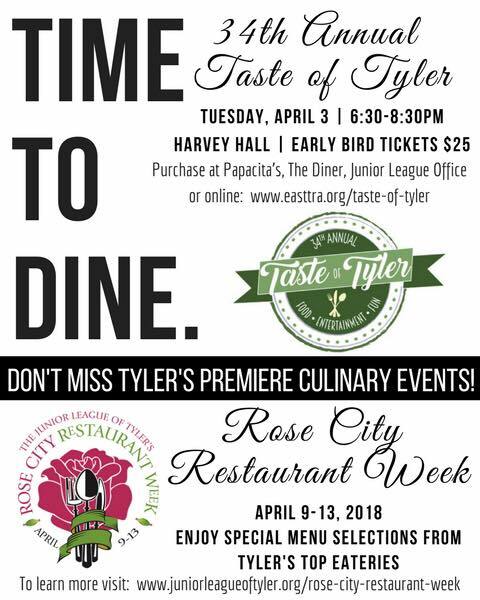 The Junior League of Tyler, Inc. is thrilled to partner with East Texas Restaurant Association this year on this event. Proceeds will go back into the community through ETRA’s funding of culinary scholarships and JLT’s support of local non-profit agencies, who address Smith County’s most critical needs. Tickets available here.